For the record, I love drugstore makeup. Not only it's affordable, but I've also found that the variety and quality of products have increased lately. We here used not to have highlighters in our drugstores like Watsons and Guardian but now we do, and one of them is Essence Soo Glow! Cream to Powder Highlighter. I bought it for only RM16.85 and it was the last one left on the shelf so I snatched it up because I had been wanting to try it for quite some time. "Breathtaking glow! This new cream to powder highlighter provides beautiful radiance for any complexion. The creamy texture with a powdery finish is easy to apply and blend with your fingers. Apply on cheekbones, on brow bone or on the outer corners of the eyes to add highlighting accents." -10 Look On Bright Side; Yellow undertone highlighter. -20 Bright Up Your Life; Cool pink coloured highlighter. As you can see, the packaging is very simple, nothing fancy. No mirror, brush whatsoever. I do like how Essence listed all of the ingredients at the back of the plastic compact. I bought the one in the shade 20 since I didn't own any colour similar to it. Ethylhexyl palmitate, Isostearyl Isostarate and Isopropyl Palmitate are generally save but according to some articles I've read online, these ingredients tend to block the pores and causing acne. I didn't experience any major breakouts while using it, thankfully! even though I sometimes mixed the highlighter with foundation to get the glow. Besides those 3, I have less concerns about other ingredients listed. No parabens used as the preservatives, but it does contain Butylated Hydroxytoluene powder (BHT) which is preferable since most of the main ingredients are made up of oils. This is the colour pay off after swatching it heavily on the back of my hands. It was hard to catch the colour right on camera, but the picture above came the closest. It does look somewhat peachy on the pan but on swatch, it has more of a pinkish undertone and I think this shade would look good on people with fair complexions. It might looks too white on medium to deeper skin tones meaning that it doesn't look good on me either. 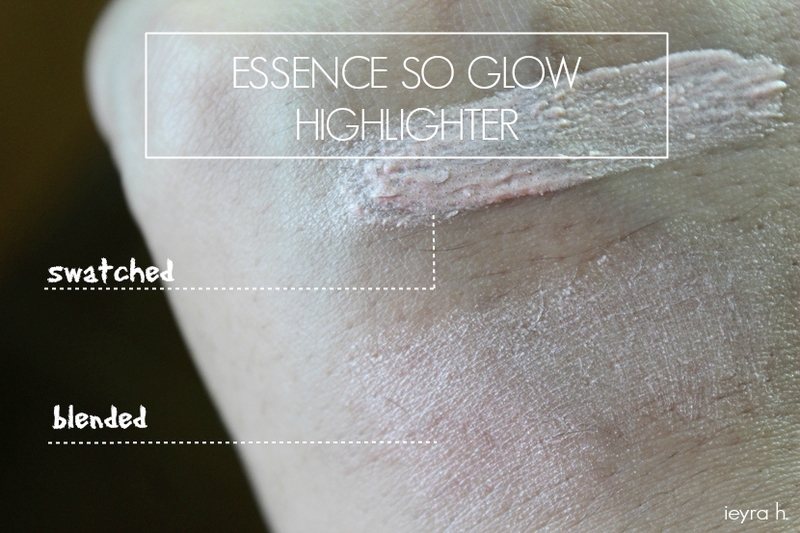 I try this on several times and the highlighter is just looking white and obvious. Texture wise, interesting. 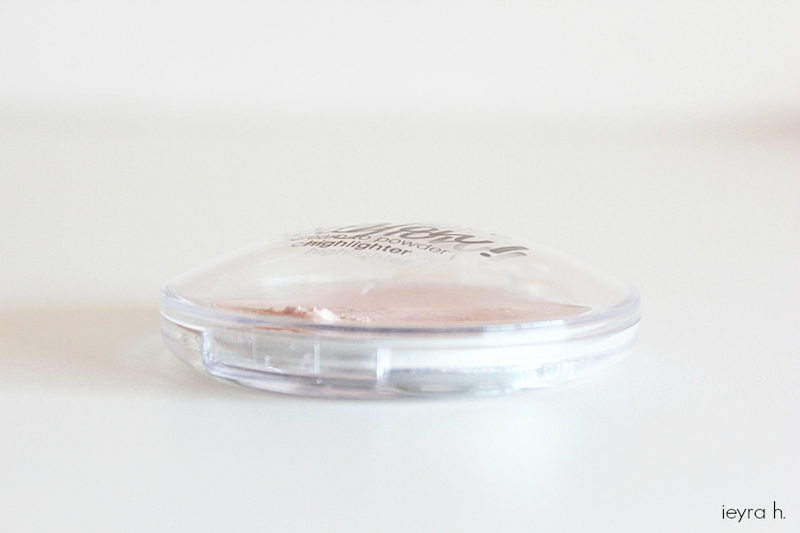 On the pan, it's creamy and very mousse-like but when you apply, it will turns into powder finish at instant. I'm under the impression that Essence wants us to blend the highlighter using our fingers because the product is almost impossible to pick up from the brush. There are a lot of glitters in this highlighter but they are all very fine in size. Finishing and how it's applied - Dislike. There I say it. My biggest problem with this Essence highlighter is how it doesn't apply beautifully. It dries quickly to the point that I don't have enough time to blend it properly. There are times where the highlighter ended up looking streaky and not smoothly applied at all. It could be my technique, or the product itself. Long story short, I wouldn't buy the highlighter again because it doesn't work the way it should be. I also think that this shade in particular, isn't a universally flattering highlighting colour for everyone. :/ Rating for this shade; 1/5. It's a shame this didn't work out, Some of the other essence products are quite amazing. i've never used any of their stuff, shame it wasn't great! I wonder why this product didn't work for you because I have read amazing reviews regarding this highlighter and I myself am on the point of buying it.